Whynter - ARC-148MHP : Portable Air Conditioner Review • The Air Geeks, reviews of air conditioners, dehumidifiers and air purifiers. 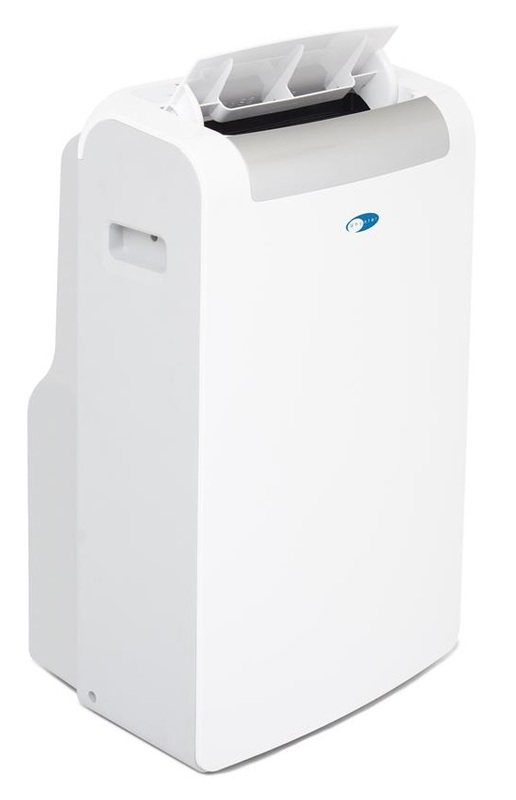 The ARC-148MHP is a portable air conditioner that offers a cooling capacity of 14,000 BTU. This compact unit utilizes an advanced self-evaporating technology and features an auto-restart function. Furthermore, it has a built-in dehumidifier and filters that ensure that the air in your room is cool, clean and odorless. If you are looking for a features-rich air conditioner that is capable of transforming the environment of your room, then you need to consider this unit. Have you identified this air conditioner as a suitable option for your cooling needs? If your answer is yes, then we have researched thoroughly to provide you with reliable information about its features, performance, strengths, and weakness. Our unbiased information will certainly help you to determine whether this is the best solution for you or not. Without further ado, let us start with its description. To start with, the ARC-148MHP is a powerful air conditioner that is suitable for small and medium-sized living rooms, offices, computer rooms, et cetera. According to Whynter, this air conditioner is suitable for spaces that are as large as 500 square feet. Using this air conditioner in rooms that are smaller than the recommended size enhances its effectiveness. Furthermore, this air conditioner offers a cooling capacity of 14,000 BTU. Does this air conditioner recycle the captured moisture? Yes, the ARC-148MHP utilizes an advanced self-evaporating technology to recycle the captured moisture for cooling the air. This process minimizes accumulation of the condensate and enhances the overall efficiency of the unit. In addition, this air conditioner offers an auto-restart function that enables it to restart automatically after a power outage. You therefore don’t need to reset the unit manually when power is restored. Are you looking for an air cooling system that can help to control the relative humidity of your room? The ARC-148MHP features a built-in dehumidifier that delivers a capacity of 71 pints in a day. Its AutoPump function allows it to pump out the accumulated condensate to an external sink. It is capable of pumping the accumulated water to a sink that is up to 15 inch above it. For heating needs, this unit features a heating system with a heating capacity of 11,000 BTU. This air conditioner offers five operational modes to enable you to control the environment of your room with ease. These modes are: Air Conditioner, Auto, Fan, Heater, and Dehumidifier. In addition, this unit offers a 24-hr timer that allows you to preset its activation and deactivation times. The Silver shield pre-filter and the 3M filter of the ARC-148MHP ensure that the air in your room is clean and fresh at all times. All home appliances that have a fan and a compressor produce an audible sound. Although this air conditioner does not produce an irritating sound, we have noted that it can be a source of disturbance especially to people who are highly sensitive to noise. However, this unit is quieter than most air conditioners of same capacity. The window venting kit of the ARC-148MHP is designed to fit in most windows. Although the manual illustrates the assembling process, we have noted that most users experience problems when installing it. Compared to some air conditioners, this unit is more difficult to install and may require more time to correctly install it. Strong dehumidifier. This air conditioner offers a highly effective dehumidifier that makes it a suitable system for humid environments. Suitable for heating needs. Its heating system is highly effective and achieves the desired temperature quickly. AutoPump function enables the unit to pump the condensate to a sink. This unit can pump the condensate to a sink that is up to 15 inches above it. Produces an audible sound. Just like most home appliances that have a fan and a compressor, this unit produces a relatively loud sound. People who are highly sensitive to sounds may find it difficult to sleep when it is running. Not easy to install. We have noted that a big fraction of users experience problems when assembling the window venting kit. We live in a tropical environment where temperatures have been averaging 92, with 80% and higher humidity due to El Nino conditions. The unit reduces the room temperature about 4 degrees during the first hour. Room size is 625 square feet with large sliding doors. Smaller rooms in the house cool much faster. More importantly, this AC removes about a gallon of water from the air in about four hours. I am extremely pleased with the performance. Yes, there is additional room noise. Not enough to keep me awake or prevent me from hearing the TV. I tried to order a two hose model but, Amazon was sold out of that model so I opted for this single hose unit, and return it, if not satisfied. Despite the lack of a second hose, I am satisfied, and will keep the unit. The hose attachment needs some additional screws to secure the hoses to the mounts. Final note, don't underestimate the importance of dehumidifying the air. This machine is a dehumidifier and can also be used as a heater in the winter." Great cooling...solved my problem with upstairs heat in guest room. Only complaint is difficulty in attaching exhaust hose to window outlet...very tricky!" Bring Whynter in the midst of summer! In case you are looking for a multi-purpose and multi-function air conditioner, then it is worth your time to consider this unit. It offers many features to ensure that controlling the environment of your room is an easy and convenient process. This cooling unit brings the conditions of your room to the desired levels within a short duration of time. Despite the impressive features offered by this air conditioner, we have noted that it produces a relatively loud sound that can disturb people who are highly sensitive to noise. Some users have also complained that this unit is difficult to install. In case none of these poses a challenge to you, then this may be a suitable solution for your cooling needs. This air conditioner costs $ 640, a honest price for a unit this good. Recommended by the Air Geeks!